Cleveland Browns tight end Kellen Winslow watches from the sidelines during an NFL football game against the Pittsburgh Steelers in Cleveland. The NFL is learning the hard way that a microscopic foe can be much more imposing than a 300-pound lineman, as a sudden slew of staph infections has sacked several players in the game. 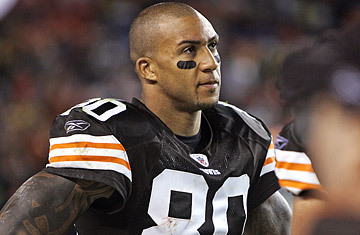 Early this week, Cleveland Browns tight end Kellen Winslow Jr. revealed that staph (short for Staphylococcus) infection had sent him to the Cleveland Clinic for three days, and he accused the Browns of asking him to cover it up. Pro football teams are notoriously reluctant to reveal any information on player injuries, but since six different Browns have caught the bug since 2005  Winslow has had it twice  the team's medical management looked suspect to some observers. "There's obviously a problem [with staph] and we have to fix it," Winslow told the Cleveland Plain Dealer. "Just look at the history around here. It's unfortunate, because it happens time and time again." The Browns, who denied that they had kept the news of his infection from his teammates, suspended Winslow one game for his rant, which included his claim that he felt like he had been treated like "a piece of meat." But the Winslow medical controversy wasn't even the worst of it for the league. In the past week, it has become clear that two of its most marketable stars, marquee quarterbacks Tom Brady and Peyton Manning, had gotten infections. The New England Patriots' Brady has had at least two additional infection-related procedures since his initial season-ending knee surgery in September. It's now possible that his knee will have to undergo another operation, which could delay his return until 2010. Staph seems to be the likely culprit, but neither Brady nor the Patriots will confirm that. During training camp staph infected a bursa sac, which acts as a cushion between bones, in Manning's left knee. The infection required surgery and forced him to miss most of the preseason. Though the Colts released a statement on Friday insisting Manning didn't contract a more perilous staph, the anti-biotic resistant strain known as MRSA (methicillin-resistant Staphylococcus aureus), the incidents should alarm the NFL. "The NFL, and all the leagues, should be diligent, and not let their guards down," says Dr. Robert Gotlin, director of Orthopedic and Sports Rehabilitation at Beth Israel Medical Center in New York City. "They've got to do better. It's got to be one of the top five priorities." The recent cases have certainly gotten players' attention. "I'm concerned, and wondering why it's happening. It's not some little infection that goes away in a few days, it's pretty serious," says Chicago Bears rookie running back Matt Forte. The league is quick to point out that it has partnered with teams to educate players about the bacteria, while the players' union insists it's alarmed and has contacted the league about further action. Some teams, like the Colts, have posted pictures on training room walls that warn players about staph symptoms and how to avoid contracting or spreading it. For their part, the Browns note that the team has previously used a special anti-staph agent to disinfect the locker room, weight room and other places where players gather. Staph, of course, is far from just an NFL problem. Two college teams, the '05 Florida Gators and the '03 USC Trojans, had multiple cases. And football is by no means the only sports victim. The infection kept Toronto Blue Jays outfielder Alex Rios out of the 2006 All-Star Game. A few days later another Toronto player caught it, and the clubhouse was disinfected. NBA players Paul Pierce, Grant Hill and Drew Gooden have had it. Staph killed a high school wrestler in California this summer, and last spring 15 students at a Pennsylvania high school were either treated for staph or symptoms caused by the virus. What exactly are staph infections? Staph is bacteria carried on the skin, which can enter the body through a cut or during a medical procedure, causing the infection. Most are minor, but certain strains are particularly resistant to anti-biotics and can cause athletes to miss significant playing time. Athletes are more likely to suffer cuts, and the locker room setting bunches players close to one another in a warm, damp environment, so they are especially susceptible to spreading the bacteria. Since football teams carry some 55 players on their rosters, and tend to have a higher degree of serious injuries to deal with, they are at particular risk. According to a 2005 survey by the NFL Team Physicians Society, 13 out of 30 teams that responded had had a player contract MRSA in recent years, for a total of 60 leaguewide infections. Though Philadelphia Eagles linebacker Omar Gaither rightly points out that "we're just a naturally dirty sport," there are several basic precautions athletes can take to lower the chance of catching an infection. Many athletes shave their ankles, legs, and arms because they don't want athletic tape ripping hair off their bodies, but experts say they should lose the razor. "No matter how careful the shaving is, you can have nicks and microscopic cuts in the skin," says Dr. Daniel Sexton, an infectious disease specialist at the Duke University Medical Center, who consults for an NFL team and several college programs. "Any time you break that barrier, it becomes a portal through which bacteria can gain access." Staph prevention is pretty low-tech. "You know, this is pretty simple," Sexton says. "Hand washing remains the primary defense against the transmissions of most organisms, including staph. Most people don't think of a locker room as a place where hand hygiene is important, but locker rooms are also mini-emergency rooms." In 2003, a team of researchers tracked the St. Louis Rams and found five players who caught eight MRSA infections. "We observed a lack of regular access to hand hygiene (i.e., soap and water or alcohol-based hand gels) for trainers who provided wound care," they wrote in The New England Journal of Medicine. Other offenses included "skipping of showers by players before the use of communal whirlpools; and sharing or towels  all factors that might facilitate the transmission of infection in this setting." In short: use a little common sense, tough guys. But when it comes to infectious germs, even a 245-lb. bruiser like Gaither believes you can't always outrun them. "You can't worry about it to death," he says. "It's not like you can walk around and put gloves on your hand every 10 seconds. Sometimes, there's just not that much you can do." Except hope that these recent cases are a coincidental hiccup, and not an epidemic that seriously tackles the NFL.